Ever wished you could play a card game without chasing expensive cards, set rotations, and net decks? Ever wished you could play a game that was nothing but haymaker after haymaker—like the games you played when you were a kid—instead of endless mulligans, tracking your opponent’s draws, and calculating the percentages of particular topdecks? Ever stared out of a window late at night with a cold drink in your hand, surrounded by piles and piles of expensive cardboard, watching the rain fall onto unforgiving asphalt and wondering what kind of person you’ve become? If you answered yes to any of the above, I suggest giving KeyForge: Call of the Archons a shot! (If you answered yes to the last one, you’re me and we need to pick up groceries on the way home tonight.) Why? Let’s talk about it! WHAT IS KEYFORGE? KeyForge: Call of the Archons is a new card game published by Fantasy Flight and designed by Richard Garfield—you know him, he made a little thing called Magic the Gathering. KeyForge is billed as a “Unique Deck Game”. Instead of buying booster packs or monthly expansions, you can just buy a whole sealed deck and be done! Each deck is procedurally generated and no two decks are identical. A unique Archon name (more on that later) and QR code on the back of the cards for each deck prevents swapping them around. With 350+ cards in the first set, there are 104 septillion possible deck combinations with the first set alone or roughly 13 368 421 trillion decks for each person on Earth. Exciting! HOW DO YOU PLAY? In the game itself, you take on the role of an Archon attempting to harvest a resource called Aember from a strange world-dungeon called the Crucible. Your deck consists of 36 cards—12 from each of 3 Houses—and the Archon for which it is named. Each turn, you activate one of the Houses, playing and discarding as many cards of that House as you like. You can attack or reap Aember with creatures, drop down upgrades or artifacts, and on and on. Then you draw back up to 6, ready all your cards, and hope your opponent doesn’t KO all your critters or steal too much of your Aember! If you’ve got 6 Aember at the start of your turn, you automatically forge one Key. Forge three Keys and you’ve won the game. The strategies will vary by House and deck. There are seven Houses—Brobnar, Dis, Logos, Mars, Sanctum, Shadows, and Untamed—and they each have different ways to win, just like colours in Magic, heroes in Hearthstone, or factions in Eternal. (For example, the demo deck I played—led by Miss “Onyx” Censorius—featured creature-fighting Brobnar, hand-controlling Dis, and shenanigans-happy Shadows.) That said, no matter which Houses you’re playing, gameplay roughly follows the flow laid out above. Do stuff, fight stuff or Reap Aember, draw back up to 6, ready your things, end turn. WHAT’S IT LIKE TO PLAY? I wasn’t kidding when I said it’s haymaker after haymaker. KeyForge is a blast. Resource management is completely different from traditional CCGs. Since none of the cards have a “cost”, the real resource you’re managing is your hand and deck. You can choose to play conservatively, hoarding cards of a particular House in your hand until you can go off with a massive turn. Or you can go all-out, activating the House with the most cards in your hand every turn and hoping to speed out the win. In my first turn with Miss “Onyx” Censorius, I drew a hand with three Brobnar cards, three Dis cards, and a single Shadows card. The Brobnar cards looked like they checked for multiple creatures to attack with, so I held off for a turn, dropping the single Shadows card—a creature called “Urchin”—and waiting to see what my opponent would do. He went hard, dropping a whopping four Untamed cards—a Snufflegator, a Dust Pixie, a Witch of the Eye, and Cooperative Hunting to take out my Urchin. Whoops. Shows me for being conservative! My board state couldn’t keep up, even with a heavy Brobnar turn to follow and some hand control from Dis cards (I have to assume that’s an intentional pun on Garfield’s part, the scamp!). A second Snufflegator let him attack my creatures and steal their reaped Aember with impunity, eventually sealing the game. I got the sense that much of the skill in the game was in adapting to my deck, rather than adapting my deck to me, and managing both hand and deck so that I was doing the most and drawing the most each turn. The correct situational analysis was far more important than simply leaning on the quality of my deck. Even with the loss, I had a blast, and my mind was whirling with possibilities and decision trees. I can’t wait to play again! HOW DOES THE GAME BALANCE ITSELF? With 104 septillion possible decks and no rarity system to speak of, it’s entirely possible that you can simply luck into buying a top-tier deck. KeyForge has two ways of handling this scenario. The first is a handicap mechanic called Chains. If a deck wins continually, its Chain increases. At higher levels of Chain, a deck’s hand size is reduced, from 6 all the way down to a possible 2 cards. Players can also bid for Chain if they believe their deck is stronger than their opponent’s. The second revolves around an app Fantasy Flight will be releasing in conjunction with KeyForge, called Master Vault. Players will be able to submit their deck for analysis by Master Vault, and the app can recommend a Chain amount based on the cards in the deck. This is aimed primarily at tournament scenarios, where analyzing a deck’s results over time may not be viable. WHY SHOULD I PLAY KEYFORGE? If you like exciting, action-filled card games, but you’re afraid of it being a lifestyle—having to follow tournament results to build the latest powerful decks, chasing card prices and expected-value calculations, and so on—KeyForge is the perfect game for you. It’s the opposite of a “lifestyle” CCG. Just show up, buy a deck, and play. It will be all you ever need, forever. If you’re like me, and you’re familiar with the lifestyle that comes with deep CCGs, KeyForge is a wonderful change of pace. It feels a lot like playing Sealed-style events or Magic pre-releases, where you have to manage with the cards you get and you learn your deck as you play. Richard Garfield has said that KeyForge is aimed squarely at Sealed play and league play, and that’s very evident in the design. All in all, I can’t recommend it enough! I’ll be diving in the first chance I get. (After I buy those groceries. And finish that drink while I look out that window.) I WANT TO FIND OUT MORE! You’re in luck! 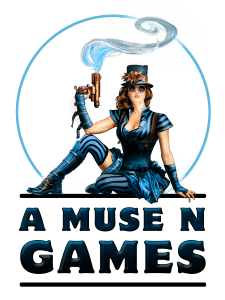 A Muse N Games is hosting a KeyForge Pre-Launch Party on Saturday, November 10th! You’ll be able to show up, learn how to play, and (while supplies last) purchase an Archon deck with bonus lanyard, glossary card, and faction pin! The game should be available in full the following Thursday, November 15th. Archon decks are currently expected to cost $14, and the starter set (with two pre-made instructional decks, two randomized Archon decks, and all the tokens and status cards you’ll need) is expected to cost $55. However, those prices are not final—check with store employees for final prices before purchasing. See you this Saturday! Jesse Mackenzie is a regular contributor to A Muse N Games. Word is still out on whether he’s changing his column name to “The Aember Dork”. Battle For Zendikar Pre-Release this Saturday!